Back in January, we noted that change would be the only constant in 2019. So far we have not been disappointed: from cybersecurity to compliance and enforcement in the Internal Market, policymakers have been moving to close key files before the end of the current legislative period. The European Commission has been engaging with stakeholders on transformation in technology and sustainability in forums such as the High-Level Expert Group on AI and the Circular Plastics Alliance, with Orgalim active in both platforms - striving for key goals such as setting the EU on the path to a climate-neutral future. And with European Parliament elections just around the corner and a fresh intake of EU Commissioners due to be appointed in the autumn, we can expect even more change to come in the months ahead. Things have been changing at Orgalim too. At this crucial moment for the EU, our membership has been working to shape our view on the role the technology industries can and should play in the future of Europe – now crystallised in ‘2030: an industry vision for a renewed Europe’, officially launched during EU Industry Days in early February. Along with this has come a change in our visual identity, with a new look and feel reinforcing the messages of the dynamic and innovative industries we represent. Some things have not changed, however: we remain true to our heritage of over 64 years as the leading voice of our industries at EU level, and are as committed as ever to working with EU policymakers to maximise the contribution our companies can make to Europe’s economy and society (you can read more on my personal take on taking this into the future here). 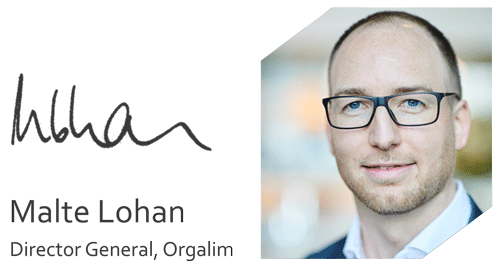 Last but not least we have also renewed our communications channels – as you can see from the brand new orgalim.eu website, our Twitter and LinkedIn feeds, and of course the newsletter you are reading right now. We hope you will enjoy keeping up with the latest news from Orgalim and our industries as we continue working to shape a future that’s good for industry, for society and for Europe. Scroll down for highlights across the segments News, Policy and Events: click 'Read more' to access the full article online or click on the banners to go directly to the relevant sections of our website. Manufacturing Performance Days 2019 (MPD 2019) is an international top level B2B summit which will be organised on 4-6 June 2019 in Tampere, Finland.